Like change, that is a constant in our life, uncertainty is niggle that will never go. Each moment of our life, we are constantly processing fresh inputs and each input brings with it fresh perspectives for us to mull on. The human mind is largely programmed to preserve, protect and pre-empt threats and dangers and hence, every input we get is filtered through the lens of self preservation. 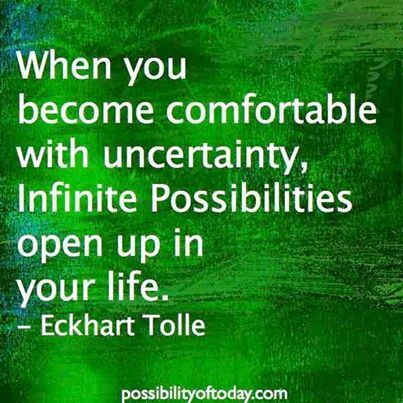 As a result, uncertainty brings with it a sense of dread, fear and worries, which threaten to overshadow the one certainty that it offers – infinite possibilities. Once we accept that uncertainty will be a lifelong companion, then it is possible for us to see it as a shadow, that seems to lurk but is never threatening. That is when we learn to face the sun, put the shadow behind us and see the overpowering light of possibilities ahead of us. Here are some ways of visualizing possibilities that can be leveraged to make life more interesting, happy and fulfilling. Think positive – Since self preservation is a natural instinct in us, we have developed our senses to anticipate trouble as being equal to uncertainty ahead. As a result we always scan the future for trouble, difficulties, negativities and danger. While it is essential that we plan for any future eventualities, that should not be the fulcrum around which our life should revolve. Look ahead with anticipation, move ahead with confidence; don’t let a few hurdles stop you from proceeding ahead. The trick is to set your goals high and to visualize yourself setting out on an adventure towards that goal with zeal, enthusiasm and faith. Remember ‘ A ship is safe in the harbor, but that is not what it is built for’. Rearrange your home and office space. It would be a proactive beginning and would also allow you to feel the power that you posses to influence the world around you when you take some proactive steps.